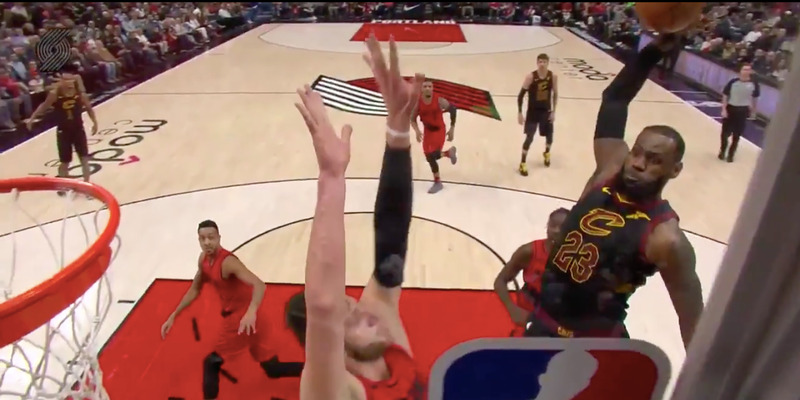 @YahooSportsNBA / TwitterLeBron James threw down one of the best dunks of his career on Thursday night, and Jusuf Nurkić was the victim. Despite 15 years in the NBA, James is still showing basketball fans things we’ve never seen before with shocking regularity. LeBron James is 33 years old, but ask him, and he’d tell you he’s playing the best basketball of his historic career – and judging by the past two weeks, he’s right. James’ latest addition to his unmatched highlight reel came Thursday night against the Portland Trail Blazers. In the first quarter, just five minutes into the game, James had the ball close to midcourt when he saw an opportunity. As beautiful as the dunk is in real time, it’s even prettier in slow motion. Even the Blazers crowd couldn’t help staring in awe of King James. This play would be enough to merit endless praise for LeBron even if it were his first insane play of the season – but it’s not his first this week. On Tuesday night against the Phoenix Suns, James broke out a windmill dunk. He had actually pulled off an almost identical dunk against the Suns four years earlier, while he was still a member of the Miami Heat. Watching the dunks side by side, it’s downright eerie. And that’s not even the end of his highlight-filled March! Two days before that dunk against the Suns, James fooled all five Lakers on the court with a fake before sending a beauty of a no-look pass to a wide-open Ante Zizic for an easy assist. And just a week before that wild play, James pulled off one of the best handles you’ll see in your life – sending a ball behind his back and through a teammate’s legs before recovering his dribble and driving to the basket. LeBron has seemed ageless this month, and even after 15 years of the best basketball we’ve ever seen, we still have no idea what he might show us next.